Named for its address, 100 East Wisconsin is a high-rise located in Milwaukee, Wisconsin. Erected in 1989 on the site of the old Pabst building, its design is reflective of the authentic German architecture which has been preserved in downtown Milwaukee. It is bordered on the west by the Milwaukee River, and is the most significant building along the Milwaukee Riverwalk. It is the second tallest building in Wisconsin, behind the US Bank Center, which is also in downtown Milwaukee. 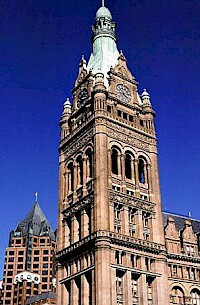 The Milwaukee City Hall is in Milwaukee, Wisconsin, U.S. It was finished in 1895, at which time it was the tallest habitable building in the United States. The city hall's bell tower, at 353 feet (108 m), also made it the second tallest structure in the nation, behind the Washington Monument. 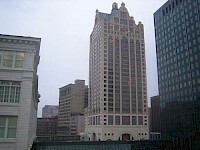 The Hall was Milwaukee's tallest building until completion of the US Bank Center in 1973. Milwaukee City Hall was designed by architect Henry C.
For the sports and concert facility formerly called Firstar Center, see U.S. Bank Arena. U.S. Bank Center is a skyscraper located in Milwaukee, Wisconsin, noted for being the tallest building in the state. 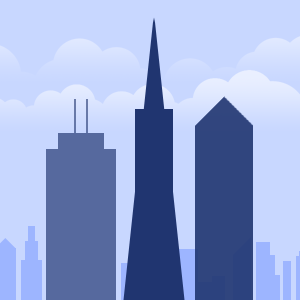 It stands 601 feet (183 meters) and 42 stories tall. Topped off August 29, 1972 and completed in 1973, the building was originally named the First Wisconsin Center, as it was constructed for First Wisconsin National Bank. University Club Tower is a condominium tower in Milwaukee, Wisconsin. At 446 feet, the tower is the tallest residential building in Wisconsin and third tallest building overall, in Milwaukee (and Wisconsin). It is located in Milwaukee's East Town neighborhood adjacent to the shoreline of Lake Michigan. The originally planned tower was designed by Santiago Calatrava (who had just designed the Milwaukee Art Museum) in 2001 and was to have only 25 stories.